It's great having a lot of books in your library, right? Of course it is! However, there is a downside. Somebody, somewhere, must figure out how to manage the collection. This is a lesson I've learned very recently. When we first began the NELP program, we started with a few hundred books. One of our high school reading teachers, a very, very great teacher named Mr. Yamada, organized the initial library. Last winter, we got a box of new books, and we were all very excited. Again, Mr. Yamada entered the information into the computer and tagged the books. Had I known he was doing all the work himself, I would have helped, regardless of my busy schedule, but I was led to believe that others were helping him. Such was not the case. However, Mr. Yamada came through brilliantly and did all the work himself. However, this April, we got a surprise that was both wonderful and yet quite daunting: EIGHT boxes of books ... and not small boxes either! Great, big boxes! There are big books, small books, thick books and thin ones of all levels. It was amazing, but it also presented us with a problem: it would be no small task to enter these into the computer. I suggested that we should ask Maruzen or the publishers to send us software and maybe a barcode scanner, but nothing came of that suggestion. I guess we're all pretty busy these days. So I took it upon myself to study the problem. Turns out there is A LOT of software ... FREE software ... for libraries that has been released under open content licenses. Well, I did a lot of digging and research. Some of them are good, some are still in development, some are finished and some will never get out of beta. 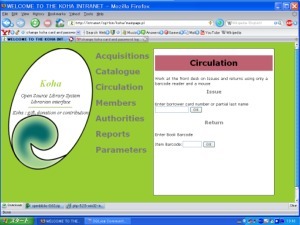 I chose a New Zealand open source software called Koha. The problem isn't as simple, however, as installing a program. I had to learn to install and configure all kinds of things: MySql, Apache, and ActivePerl. Some software I had looked at required Php, so I installed that for good measure. ActivePerl and PhP were pretty simple ... I'm not sure what they do, but they were simple to install. With Apache and MySql, I found it better to install Apache first and then MySql ... or was it the other way around? I installed, uninstalled, reinstalled and threw temper tantrums multiple times over the course of a hair-pulling evening and morning. The end, though, was quite simple: Check online, follow the directions, don't skip ANY steps, and make sure your passwords are correct. It took a few tries, but the end result is very satisfying. Wanna see? Now all I have to do is figure out how to retrieve Marc data and see if z39.50 really works on Koha ... and if you don't know was Marc21 or z39.50 are, don't worry. Last week, I didn't know what those were either. Also, now that I have installed Apache and MySql, knowing nothing about them, I'm curious to know if I can network my laptops to my desktop and have an in-class network. That would be super-cool! This year we are beginning our high school NELP program. We currently have 4 regular High School First Grade NELP students, and 8 mixed-grade NELP students. Simply put, students who graduate from Seishin Junior High School's NELP program, or who graduate from Seishin Junior High School and have passed the Eiken Second Grade STEP test, are eligible to join the High School NELP Oral Communication Class. Any student, both graduates of Seishin Junior High School as well as graduates of other junior high schools, who has passed the Eiken Second Grade STEP test is eligible to join our 8th Period NELP class. The 8th Period NELP class is after school on Friday, from 16:15 to 17:00. There are three different courses and three different teachers. Our current Princeton in Asia intern, Claire, will teach Creative Communication. This course will include conversation, skits and role-plays. It is designed more for students who are interested in the humanities and conversational English. Shelly will teach Research Topics. This course is designed more for our science students, and is geared more for presentations, research papers and formal English. I will teach Independent Studies. This is for students interested in studying for English proficiency tests such as Eiken, TOEIC, TOEFL and others, as well as students who want more time to study their regular English work. These courses will include a mix of first, second and third grade students. Each term, students may change the course they are studying. I hope that this will be a successful program. I'm currently teaching my three former junior high school third grade NELP students in my independent studies course, but I'm not sure if they will stay in my course next term. This will be my fourth year teaching two of these students, and my third year teaching the other student, and I'm afraid they may be a little tired of me, as evidenced by the student who, upon hearing that I would be her teacher again, made a heart-breaking display of disappointment. Perhaps she was hoping for a teacher with more hair? Well, it has been more than six weeks since my last entry, and that really surprises me. I wasn't aware that it had been so long. During the last six weeks, I've been extremely busy. First, there were final exams. Third Term, I had to make FIVE different final exams. This year, I shall undoubtedly long for those 'good old days', as this year I will have EIGHT final exams to make! This year, I will be teaching 18 lessons a week ... with no repeats! Each lesson will be completely different. That means I have to plan 13.5 hours of lesson time EVERY WEEK! Also, I teach NINE completely different courses. In first grade, I will be teaching English A (Writing), English B (Reading) and Oral Communication. In second grade and third grade, I will be teaching English B and Oral Communication. I will also be teaching high school first grade Oral Communication, and a special mixed-grade high school NELP class. If you want to be particular, you could say I'm teaching ten different course because I also teach junior high school first grade Special Projects (although the grade is part of their oral communication grade). Needless to say, I'm somewhat overwhelmed by the magnitude of this year's class load. Will I survive? Only time will tell. What is nice is that this year, we have a new NELP teacher! His name is Brian Timms and he is from Canada. In addition to teaching SELP classes, Brian will be teaching junior high school second grade NELP English A (writing). Originally, we had planned not to have English A in second grade because the grammar is becoming more difficult, and we thought it would be better to integrate the SELP and NELP students for English A. However, this year's second grade class has SIX students who have passed the second grade Eiken STEP test, and so the second grade Progress in English textbook really doesn't have a lot to offer them, seeing as how they have all lived overseas. So we have passed a new rule that if we have five or more students in one grade who have passed the second grade Eiken STEP test, then they can form a NELP English A class. So, how are my classes this year? Well, I have 7 first grade students, 14 second grade students, 7 third grade students, 4 high school first grade students, and 4 students in my 8th period NELP independent studies class. Three of the students in Independent Studies are also in my high school first grade Oral Communication class. One student in oral communication will not be participating this year in the 8th period classes due to other obligations. One second grade student will be joining that class. It will be nice to teach her again, because I taught her when she was in junior high school first grade, back before we had a NELP program. I hope in spite of my busy schedule that I'll be able to update this blog more or less regularly. We'll see. Wish me luck.